About 2,000 British Airways cabin crew have voted overwhelmingly for strikes in a dispute over pay, the Unite union said. 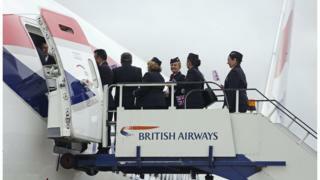 The workers, who represent about 15% of the airline's cabin crew, were balloted about the plan to strike at Heathrow. The vote comes after cabin crew rejected a 2% pay rise. Strike action could begin after 21 December, but Unite has not confirmed whether the strike would affect travellers over Christmas. BA said Unite was "creating uncertainty" for passengers. Tensions have been running high over pay and conditions at the airline. Some 79% of crew that took part in the ballot voted for action, Unite said, urging British Airways to return to the negotiating table. The dispute concerns about 4,000 staff who have joined the airline since 2010 on "Mixed Fleet" contracts, who do not feel they are paid enough. About 2,500 of them are Unite members. Earnings were advertised between £21,000 and £25,000 but, in reality, start at just over £12,000 plus £3 an hour flying pay, Unite said. "Not surprisingly, the crew have rejected a 2% pay offer and on-board customer service managers are furious," the union said. "They do not have collective bargaining rights. The managers have also endured a six-year pay freeze." According to a recent Unite survey, half of Mixed Fleet staff have taken on second jobs to make ends meet, and more than two-thirds were going to work "unfit to fly" because they could not afford to be off sick. It said 84% reported experiencing stress and depression since joining BA because of their financial circumstances. Some even admitted sleeping in cars between flights, because they could not afford the petrol to get home. Unite regional officer Matt Smith said: "Not only are the pay rates indefensible, but in aviation, low pay is a safety issue." A BA spokesman said: "We are extremely disappointed that the union is creating uncertainty for our customers. "Mixed Fleet Unite represents about 15% of our cabin crew. We remain focused on resolving this issue as quickly as possible without any disruption to customers." The spokesman added: "We have proposed a fair and reasonable pay increase to Mixed Fleet cabin crew which is in line with that accepted by other British Airways colleagues and which will ensure their reward levels remain in line with cabin crew at our airline competitors."